As promised in last Thursday’s post I am announcing a new contest today. Let’s change it up a bit and start with a description of the prize. 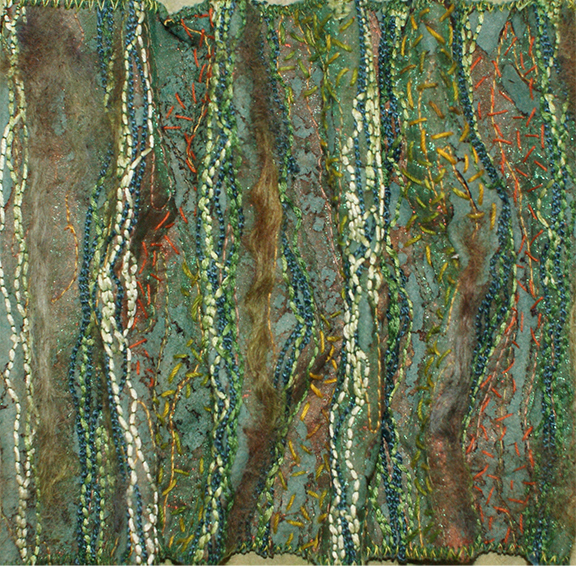 The image today is of one piece from my Fiber & Stitch series. Each piece created is unique and was mounted in a 10″ shadowbox frame, ready to hang. The base fabric is sea foam green embellished by hand and machine and manipulated for extra dimension. How can you claim this little gem? It is easy! I appreciate everyone’s comment, and I have made it a personal goal to answer each and every question since I began blogging. Let’s step it up a bit: I encourage you to leave a suggestion or request for future blog posts in the comment section from now until May 15th, 2013. During the next 6 weeks I will collect your name and add it into the proverbial hat, once you leave a suggestion in the comment box under any post. On May 15th one name will be drawn and declared the winner. I will send the framed Fiber & Stitch piece once I have contacted the lucky recipient for their address. Do you have a specific interest related to fiber, design, art, teaching, exhibiting or judging? Formulate your question and I will start posting. Put your thinking cap on and fire away. Do you have more than one question or suggestion? Post as many and as often as you like. Each time you add to the comments section your name is placed in the hat. The more you comment the higher your chances for winning. What do you think? Are you excited? I know it isn’t nearly as good as chocolate Easter eggs… but it is lower in calories. Enjoy your holiday weekend! Once again – Happy Easter, everyone. 31 Mar	This entry was published on March 31, 2013 at 7:22 am. It’s filed under Announcing New Contest, Art, Journaling, Special event and tagged Arts, Chocolate, contest, Easter, Easter Bunny, Easter egg, Fibre & Stitch series, Happy Easter. Bookmark the permalink. Follow any comments here with the RSS feed for this post. Hi Anna, I have a very practically-based question. It’s about storing the pieces one has created. I currently have a couple of “stacks” of quilts and wish I could figure out a system that would keep them safe, unfolded and easy to access. I definitely do not have enough space to hang them on. How do you store your art pieces? Great topic, Kathy! Consider yourself entered into the draw. I will devote a post covering your question in the near future. I look forward to meeting you at Quilt BC in Penticton. the question I would pose is how do you decide on the size you will make your piece? Hi Joanne, I also look forward to meeting you this coming week. Great Question – you made into the draw. I will elaborate on it in a future post! Hi, Anna, when I first met you, I offered to show you some special windows where I volunteered. I now sometimes “get” the idea of emotional inspiration, and must try to pull that out to examine what touches me. Your walks and photographs also made a connection for me. My latest walk was through my garden for all blooms in May. I wonder how you organize your inspirations. Do you have boxes of notebooks? Do you leaf through pages often, or do you get inspired, run with it, and are done with it? Joan, I remember you… but I still have not been back to Victoria since 2006. Penticton next week will be the furthest I am venturing West. I will add your question to the list and will elaborate with a blog post answer in the future. Thanks for leaving this in the comment section. Hi Anna, Another lovely quilt of yours!! My question deals with traditional quilting and functionality, is there a place to put artistic design and new mediums into traditional quilting? Would it look tacky? It would be nice to have some ideas. Thanks in advance for your response. Hi Shirley, I am so glad you are entering your name into the draw with such an excellent question. I will answer it in detail in one of the upcoming blog posts. Hope all is well in the old neighborhood! Thanks Anna for having great ideas and giving places to look further on the subject. I get great info reading your blog. Thanks so much. Thanks, Brenda! Let me know if you want me to cover a particular question. Ah, Anna, I’ve been quietly hiding out in the back of your ‘blog master class’ only to be awakened by your enticing fibre piece contest. I have been meaning to share for a long time about how much I have treasured all that you share of yourself with all of us. If I do not comment, it is not because I am ambivalent. Ah shucks, silent no more. Rhonda – even the most quiet lurker will eventually succumb… Thank you for posting your most excellent question. I have entered your name into the draw and will include answers to your query in one or more upcoming blog posts. Many thanks! A very inspiring prize! I was greatly inspired by a two day class with you a year ago and that inspiration has led me to other teachings and techniques. My question is how to find and develop a personal voice: I seem to dabble in many styles and haven’t found one that seems to be mine. Susan! How wonderful to see you commenting and asking a question. Your name has been entered into the draw – and I am looking forward to creating a post to answer your timely question. Many thanks! I would find it most helpful to get in-depth info on finishing details such as binding, hanging and mounting art quilts of various sizes. Thanks so much for continuing informative blogs. Donna-Fay, thanks for your request. I have entered your name into the draw. I need to point out that my blog is not so much a “how-to” site. I feel it would be great to post videos and hands-on tutorials but while I live in rural Saskatchewan and work with a satellite internet connection that is over-subscribed I am not able to upload such content. Have you tried Linda Seward’s Book “The Complete Book of Patchwork, Quilting and Applique”. It is one book we highly recommend for the Judges’ Certification Program in Canada. Linda addresses many of your interests. I also want to point you to UTube for countless tutorials on the topic of finishing, hanging and mounting. While I teach what you are looking for I advise each student individually on how to finish, hand and/or mount their work. My own work is much the same – I design and create – and lastly I decide how to finish etc. After 16 years in the field I still find that there is no one perfect answer or suggestion – I continue to try and build my repertoire. Now for a post idea. Over the years I have tried many different creative outlets but have mastered none. I am reminded of a story about Lucien Pavarotti that I’ll paste below. My question is how do you know where to put your time & energy? And how do you summon the courage to ‘sit on one chair”? In a Guidepost story, the world renowned tenor Luciano Pavarotti shares a story about growing up in Italy. “When I was a boy, my father, a baker, introduced me to the wonders of song,” he relates. “He urged me to work very hard and develop my voice. Arrigo Pola, a professional tenor in my hometown of Modena, Italy, took me as a pupil. I also enrolled in a teachers college. On graduating, I asked my father, ‘Shall I be a teacher or a singer?’ “Luciano, my father replied,” if you try to sit on two chairs, you will fall between them. For life, you must choose one chair.” I chose one. It took seven years of study and frustration before I made my first professional appearance. It took another seven to reach the Metropolitan Opera. A great topic, Susan. Trust you to come up with this topic near and dear to my heart. I will elaborate on this in the near future. Thanks for this – your name has been added to the “hat”. My current fascination lies in the topic, “Do art quilters who come to the work as artists, using textile as their medium, differ from those who come to the work from a sewing/quilting (versus art) background?” And…a sub-question: which ‘group’ has had more success as quilt artists? Or has this even been examined? Margaret, this is a question or two to ponder and will require significant research. I will address this topic at a later time when I have sound information. It is something you may want to explore yourself when you meet up with fellow artists at the SAQA conference in Santa Fe at the end of this month. Thanks for the question – your name has been entered into the draw. Happy Easter, this is way better than chocolate! I enjoy your photos and would like to see how you use them in your work. Thanks for the question, Bonnie! Your name has been entered. Meanwhile I invite you to check out my website. Go to the 2012 gallery and check out the “Polar Embrace” body of work. All these works are based on photos. I will elaborate on this topic in the near future. Wow! Trust you, Anna, to encourage and inspire in such a creative way! MUCH better than chocolate any day. My first question has to do with space (room). I have found since moving into a much smaller home that I am less apt to take out any of my art pieces in progress. There is no space for even a small design wall, under bed storage is already used for home canned goods, etc. My only work area is our small, full dining room, and as you know it’s extremely difficult to put away something that has our creative juices flowing full stream. Do you have any suggestions that would make it easier to put a WIP (app 2′ x 2′) safely away when mealtime or company comes? Thank you for this opportunity, Anna, to not only ‘ask the expert’ but enter such a fabulous draw! Linda, I know how this feels – when we first moved here I did not have a studio and battled the same demons… I will elaborate on this topic in the next little while. Your name has been entered into the draw. Thanks for taking the time to post a question. I really like the variations in the design you have in the picture. I have some beginner questions since I’m not familiar with fiber arts. What are all the types of materials you can use in fiber art? Thank you for your question. I will be posting answers to your query. Your name has been entered for the draw. Happy Easter to you, Hennie! Good to see you visiting the blog – can’t wait for your question(s). Hi Anna, I’ve been working with wool and silk rovings and doing some needle felting. Another idea to incorporate into our fibre work. If you haven’t already talked about using rovings I wonder if you would be interested in having some discussion around this topic? Thanks. Hennie, I just discovered your question. Thank you for posting it – I have entered your name into the draw. The topic is current and I will create a post around the topic in the near future. Hi Anna, The prize is awesome – I love the use of fibers in any piece and also the hand stitching. My query would be: how do you come up with ideas to design an art piece? I know your photography would be high on your list, but what about others? Best of luck with the draw – your name has been entered! Other than for work which you are submitting for a show, how do you most often finish the piece? Do you keep the back of your work as presentable as the front? I have seen both extremes. Thanks for the question. I will post answers to your questions in an upcoming blog post. Best of luck – your name has been entered into the draw. OMGosh what incentive! Not only are you asking us to post a question or query that you will answer with your remarkable artistic skill, and knowledge of all things fibre art….but we may also win a lovely piece of your work!! Imagine my joy when this image is the prize…..art in my favorite colors! Thank you for a lovely start to the day! Hi Vivian, thanks for commenting. Glad to see the excitement this little challenge is generating!